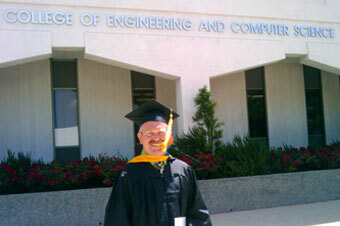 REDDING, Calif. – Curt Dodds, Simpson University’s director of information technology, recently graduated with a Master of Science in Software Engineering degree from California State University, Fullerton. Dodds was among 10,000 graduates during the university’s spring commencement ceremony and one of over 300 graduating from the college of engineering and computer science. Dodds, who earned a bachelor’s degree in philosophy from Westmont College in Santa Barbara, has nearly 25 years of experience in the software engineering field. He said it was time to earn academic credentials in a graduate program related to his area of expertise. Though he didn’t originally think the master’s degree would relate to his current job, Dodds said a lot of the information he learned can be applied directly to his job at Simpson. “It was a hidden benefit to me that I could adapt so much of what I learned to the university environment,” said Dodds. Dodds’ parents, Stand and Elaine, wife, Lori, and kids Ryan and Kristin watched him as he earned his diploma.